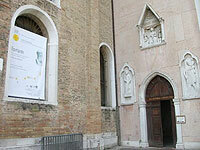 On Monday 9th and Tuesday 10th of June the Academy of Art of Venice was host to the 1st CEI Venice Forum. The initiative, which saw the participation of about 30 cultural operators from 14 countries, offered the participants an opportunity to bring together, compare and discuss, in the course of two plenary sessions and a working group session, their experiences and objectives in the field of networking, co-curatorship and coproduction. In particular, the intense working group session yielded very interesting results: the participants, representing museums and institutions from Belarus, Georgia, Hungary, Moldova, Poland, Russia and Ukraine, as well as fully endorsing the idea of working on a joint project, which should lead to a series of shows opening simultaneously in a number of selected venues in Autumn 2005, also achieved to establish its conceptual framework identifying as the main theme the idea of identity and the perception of the "other" in and beyond the new Europe. Equally important, from a more theoretical point of view, were the two plenary sessions which, taking their cue from an extensive and intense debate on the "Current and future needs of cultural interaction", resulted in the drafting of a document signed by the participants. The document is an appeal to national governments and international organisations to provide continuous structural and financial contributions to contemporary art, to guarantee that it remains autonomous and free from any type of political pressure and to foster and support the creation of partnership projects and multidimensional capacity building exchange programmes. The declaration will be circulated among the representatives of ministries and international bodies. The 2003 CEI Venice Forum, which follows the first pilot edition held in the same premises in 2001, has, with this edition, become a fixed biennial appointment and was organised by the Trieste Contemporanea Committee with the patronage of Central European Initiative (C.E.I. ), the European Parliament - Office for Italy, Regione Veneto and the Municipality of Venice, under the auspices of the Italian Ministry of Foreign Affairs, in collaboration with the Academy f Fine Arts of Venice and with the support of CEI, Regione Friuli Venezia Giulia and BEBA Foundation. - Are you a cultural institution? Can you help us?